Nourish your hands with the ultimate, creamy moisture of this rich hand cream. 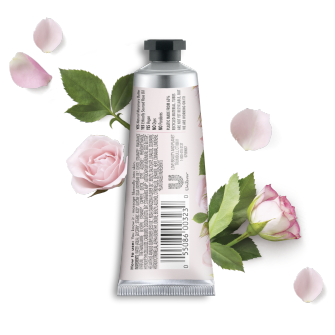 Infused with delicate rose fragrance and natural murumuru butter, this hand cream reveals gorgeously soft skin. This hand cream is also cruelty-free, paraben-free, dye-free. Nourish your hands with the ultimate, creamy moisture of this rich Hand Cream. Infused with delicate Rose fragrance and natural Murumuru Butter, this Hand Cream reveals gorgeously soft skin. All our hand creams are free from any parabens or dyes and are certified Vegan & Cruelty-Free. The formula is infused with organic Murumuru Butter, an ingredient which is a lot like Coconut Oil. Murumuru Butter comes from the white fat found in the nuts of the Amazonian Murumuru Palm Tree. That fat is known to be deeply moisturizing, so it helps nourish, soften and protect against dryness. Plus, our luscious Hand Cream is also infused with ethically sourced Rose Absolute from Bulgaria, and exudes a rich, warm floral Rose fragrance experience. In this fragrance, the natural vibrancy of the Rose notes is enhanced by the juicy freshness of Red Berries delivering an intensely feminine and refreshing scent on your hands. 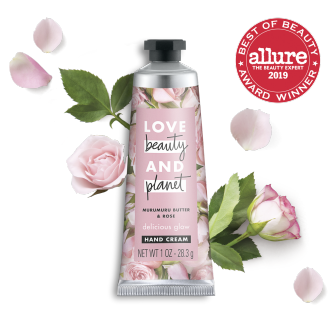 Love Beauty and Planet® Murumuru Butter & Rose Hand Cream works to moisturize and reveal gorgeous skin. murumuru butter & rose hand cream is rated 4.6 out of 5 by 150. Rated 5 out of 5 by cmcmaster3163 from Forst and foremost I got this hand cream free from Influenster to try and review. Diving in hands first! So when I first opened it, I liked the fact that it was sealed by a little piece of foil. When I got that off I smelled it, smelled really good. Not a strong rose smell but very sweet and simple. I applied it to the top of my hand and it was thick and creamy. As I rubbed it into my hands it left them feeling soft and smelling great. Not leaving a greasy after feel, I was able to do household chores afterwards without feeling slippery. All In all a very good product I would be purchasing this once I run out of this free sample! My hands feel so refreshed and soft! Rated 4 out of 5 by morena94 from Love the package! It's not an overpowering scent, and absorbs quickly and softens skin. I live the fact that it fits perfectly in my purse. Easy to use. I live the scent. Rated 4 out of 5 by sabrinah50a8 from I received this cream complimentary from influenster for review. This hand cream is very moisturizing as it has murumuru butter. It smells like roses. I personally dont love the rose scent and it can be overwhelming if you dont like it. It has no silicones, parabens, or dyes for anyone looking for a clean brand which I personally appreciate. The packaging is beautiful and girly. Its a perfect size to fit in your purse or office drawer. If you like rose I recommend this cream. They do have a couple other scents that I plan on trying because I really like the cream itself. Rated 4 out of 5 by mcwowy from I tried this hand cream on my driest, worked-all-day hands, and it was....ok. It was thick and creamy, like a cream should be- check. It absorbed into my skin quickly, and I appreciate that- check, check! And it softened my hands well, however, not as well as a few other hand creams that I've used in the past. But my biggest issue was the scent; it was overwhelming! In my opinion, it could be dialed down a bit. The scent of my moisturizer should not overpower the scent of my perfume. All in all, not a bad cream. I carry it in my purse and continue to use, sparingly. Rated 4 out of 5 by stephaniey1421 from I received this item complimentary in my VoxBox thanks to Influenster. The scent is absolutely amazing and I don't typically like floral scents. 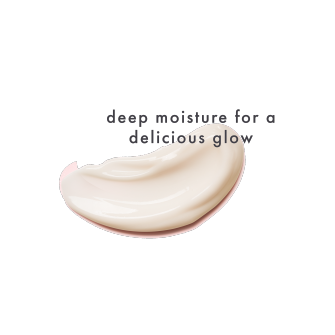 It is a gentle formula and absorbs into the skin quickly without leaving a greasy feeling. My hands get extremely dry and cracked in the winter. I use this hand cream at least 5 times a day and it has cleared up all of the painful cracks I had. Unfortunately, my hands are still pretty dry. This hand cream does work much better than a lot of others I've tried, but it isn't the best for my skin. It does work well for my 6 yr old daughters normal/sensitive skin. I think this will work much better for me during the spring/summer months. I'll definitely be giving it another try when we get warmer weather.